Jimmy Stewart plays detective John Ferguson, but his friends call him Scottie (wink). After a rather disturbing accident that occurs on the roof of a building while in pursuit of a suspect, Scottie develops acrophobia, a debilitating fear of heights. While Scottie is on medical leave, he is contacted by an old friend to do some freelance PI work. 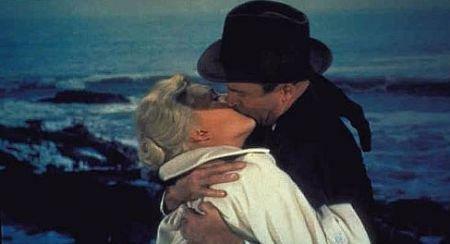 Gavin Elster (Tom Helmore) hires Scottie to follow around his young wife, Madeleine (Kim Novak, originally cast as Vera Miles), who he’s nervous is a danger to herself. She wanders aimlessly and has been acting strangely. He then drops a bomb on Scottie. Madeleine has an ancestor, Carlotta Valdes, who ended up going crazy and killing herself after giving birth to an illegitimate child. Gavin is worried that his wife is being possessed by the spirit of Carlotta. Scottie agrees to the task, and shortly after he begins following Madeleine he ends up having to pull her from the river after she jumps in. When she comes to, she says she can’t really remember what happened, like she was in a trance. From that point on, the two form a bond and start wandering together. Scottie notices her strange actions and listens to Madeleine’s pleas for help. She’s scared that the spirit of Carlotta will force her to commit suicide, like she did. Before he knows it, he’s fallen in love with her. On one outing, she takes him to an old Spanish mission and tells him she’s been there before, but a long time ago. This is Carlotta speaking. She then goes crazy and runs into a church and up the stairs of the bell tower. Do to the acrophobia he developed as a result of his roof accident, Scottie is unable to follow Madeleine as she runs up the steep staircase. He watches in horror as she plummets to her death from the top of the tower. It seems like this would be the end of the film, or at least close to the end, but no. We’re more like in the middle at this point, and a whole new film is about to spring up. After Scottie is acquitted of any wrong doing or responsibility for Madeleine’s death, her memory consumes him. His love for her mixes with his profound guilt in not being able to follow her, and he becomes obsessed. When he spots a young woman on the street who resembles Madeleine, he goes full-on-stalker. He convinces Judy, the lookalike, to go out with him and dress a certain way and change her hair color. She’s troubled by the fact that she now looks exactly like Madeleine, but has fallen in love with Scottie and doesn’t care. After finding some suspicious clues in Judy’s apartment, Scottie realizes that something is off about her. She looks too much like Madeleine, and has things in her possession that only Madeleine would have. One night, Scottie drives her to the old Spanish mission where Madeleine died, and throughout the corse of a frantic and rather terrifying scene, Scottie reveals to her that he knows she played Madeleine to cover up the murder of the real Madeleine by her husband Gavin. 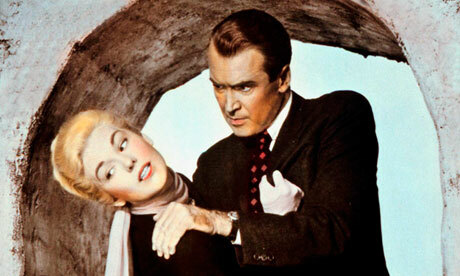 He’s enraged with Judy for tricking him, for making him fall in love with a woman who was already dead. He forces her up the steps of the bell tower, conquering his acrophobia. 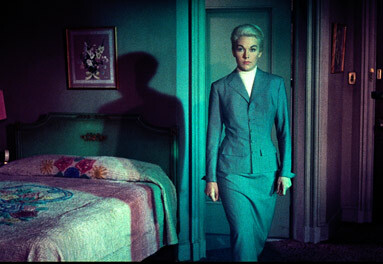 Judy tells him she loves him and begs him to forgive her, which he eventually does. He embraces her, and everything seems to be well, but at this moment a dark figure emerges from the shadows. It really is pretty terrifying looking, and Judy tries to back up, scared it might be Gavin. But she steps too far and falls off the bell tower to her death. In the last bit of irony, the dark figure is revealed to be a nun, not Gavin. In the end, the scam is revealed to the authorities. Gavin had concocted a way to murder his wife and stage it as a suicide in order to inherit her family’s wealth. He used Judy to pose as his wife long after she’d been dead, and paid her to act strange and slightly suicidal. Gavin needed Scottie as a credible witness to give authority to the narrative. Gavin knew Scottie would never make it to the top of the tower, thus he would never see Gavin waiting for Judy with the real Madeleine’s dead body. When Judy reached the top, he threw the body off the tower. Scottie testified that Madeleine wasn’t in her right mind, and that the death was in fact a suicide, falling right into Gavin’s plan. It was a crazy plan, but it would have worked if Judy had just left town. The script was based on a French novel titled The Living and the Dead by Pierre Boileau and Thomas Narcejac, which I’ve never heard of, but if it’s as trippy and crazy as the film then I’m definitely interested in picking up a copy. 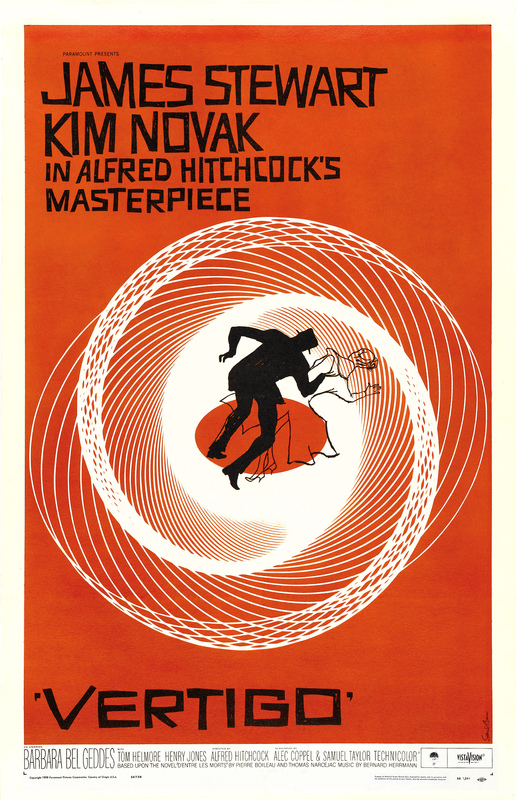 Vertigo popularized the dolly zoom that is referred to in some circles as the Hitchcock zoom (or the Vertigo effect), as well as in-camera effects and a ton of strange graphics used to distort perception (both literal and mental). This all adds to the theme of insanity and helps illustrate Scottie’s slip into it. If this film is great it is because it deals with nasty truths of mental illness honestly. Everything from the colors and costuming was decided with that theme in mind. All these small details really built up and created an unsettling result. If you’ve never watched this now classic Hitchcock and you have a few hours to spare on a rain evening, I recommend you dive in! Get ready for some serious strangeness, however. Thanks. 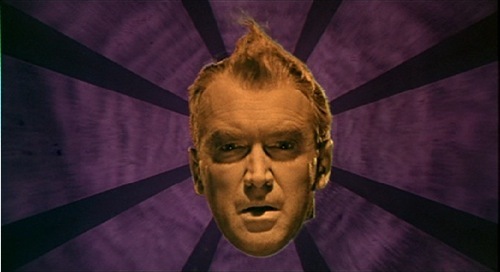 Vertigo is endlessly watchable. The most extreme film Hitchcock ever made. 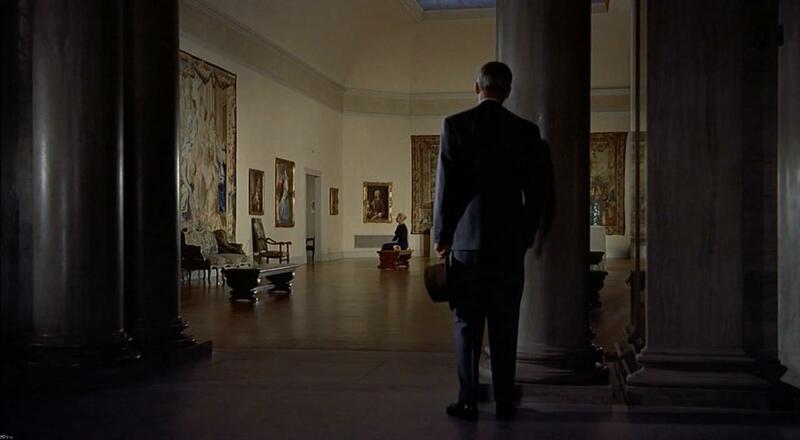 Film as dream, nightmare, obsessive desire. Regards from Thom at the immortal jukebox.